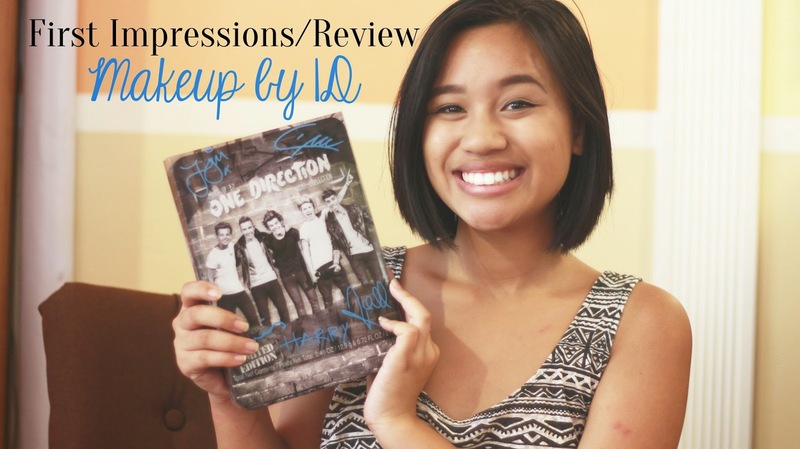 Makeup by One Direction: First Impressions and Honest Review! One Direction is currently the most popular boy band in the world, and I just so happen to be a fan of them. I didn’t get into them until early this year, and up until then, I just didn’t care much for them. However, when I first got into them, I first noticed how talented they were… and then I noticed how attractive they are not too long after, haha. I also always thought (and still think) it’s so weird how crazy girls go for them! I’m a huge fan of them too and follow them all on Twitter and all that, but it still mindblows me how much of an influence they have over the 12-15 year-old girls of this generation. So when I first heard that 1D was coming out with #Makeupby1D based off of their 3 albums, I was intrigued. I’ve never really been into fan merchandise for any band/artist other than T-shirts, mostly because of how corny fan merch usually is, so I was curious as to how the boys would approach this makeup line when the announcement was first made. And then, I received the opportunity to receive and test out one of their 3 collections courtesy of Markwins and BrandBacker, and I just had to jump on it! The boys have 3 different collections, one for each of their albums. I got to test out their "Up All Night" collection, which is a mostly blue color palette with cool neutrals and nice pinks to balance it out. My first impression of the collection is that the makeup itself and its presentation was pleasing to look at. And although it is pleasing to the eye, now that I think about it, the tin itself and the plastic cover with the boys feels a little young and childish. If friends saw the tin, I felt a little immature with it. Even though I’m not yet 20 years old and I’m the same age as Harry, I definitely am one of their older fans. Anyway, back to the makeup. Each tin comes with an eyeshadow palette, an eyeliner/body pencil, a color-changing lip gloss, a lipstick, a “Little Black Dress” mascara (that one’s included in all the collections), a nail varnish (aka nail polish), and some stencils. I just did a review of this collection on my Youtube channel, so if you would rather watch it, you may do so! If you’d rather read about it, keep reading below. I started out with the lip gloss. I like the color, but I’m not a big fan of lip gloss because of how sticky they tend to be. I have yet to actually try the lip gloss on my lips, so maybe this one can change my mind. Another unique trait about this lip gloss is that under ultraviolet light, it changes colors, and this one changes into a neon orange under black light. I think that this trait is for the club-goer. But for me, I’ll probably bring this lip gloss to church and try out with our black lights, haha. 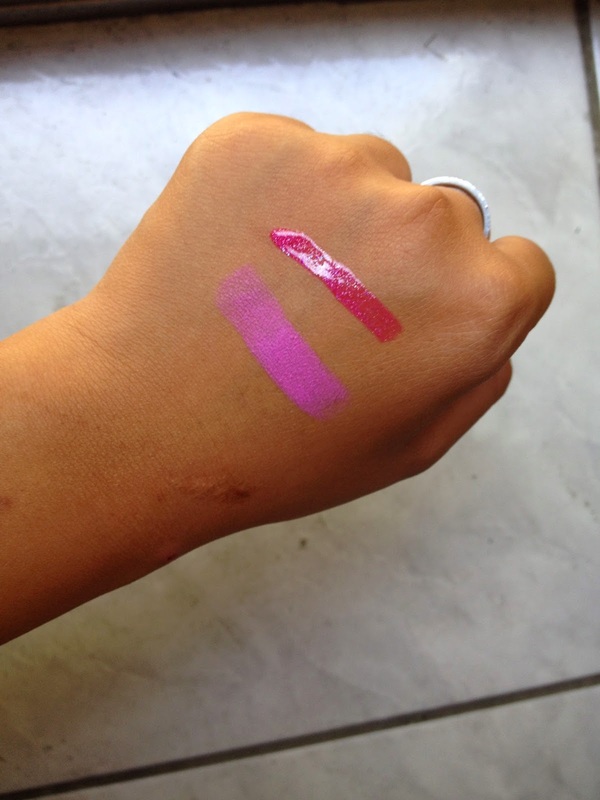 I swatched the pale pink lipstick as well, and so far I like the color, but I had to build it a little on my hand before seeing the color well enough on my hand. Most lipsticks dry out my lips, so I’m curious as to how the lip stick will fare on my own lips. Up next was the eyeliner pencil. 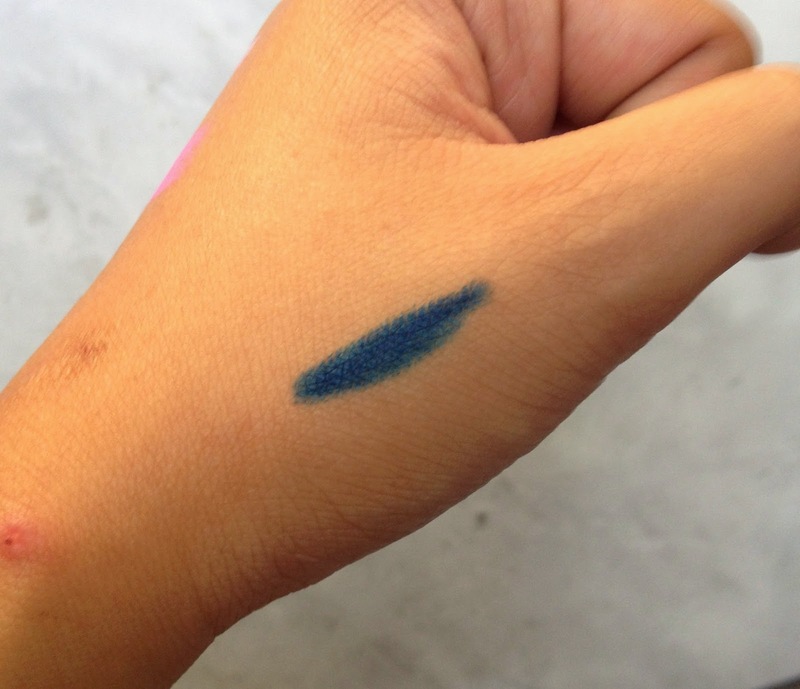 The color is described as “denim blue” on the packaging, but it’s basically a navy liner. And OH MY GOSH, I love this eyeliner so much! When I swatched it on my hand the pencil glided and I didn’t put much pressure on my hand either. I love the consistency and color so much. What I also love about the color is that it’s different but it’s still neutral enough not to be too crazy. But again, I hope that it doesn’t melt off my face later. I tried out the eyeshadow palette next, and I was a little disappointed. It wasn’t amazing, but it wasn’t horrible either. 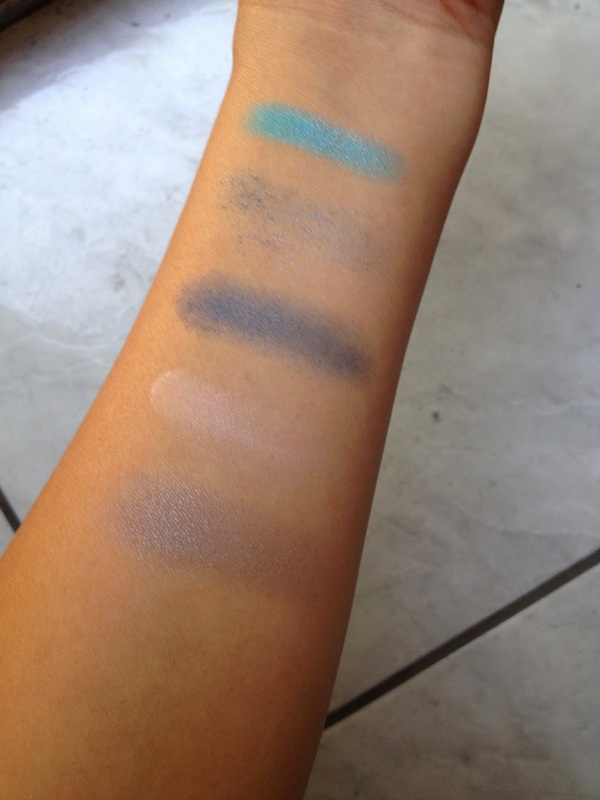 The sky blue color was the most pigmented, and I feel like with all of the shadows (especially the dark blue glitter in the middle), if you don’t have primer on your eyelids, there will be tons of fallout. The glitter looked really pretty, but I did not enjoy it when I swatched it because I thought it would be a glittery shadow, instead of just glitter. It felt like I might as well have gotten loose glitter in a pot rather than having it pressed in the palette. Out of the colors, however, the gray and pale pink colors would be the ones that I would use the most. Out of the blues, the navy blue color would be the one I would probably gravitate towards. I haven’t tried the mascara yet, but it looks like any normal mascara. Part of me feels like it is going to be a really watery formula, which isn’t a good thing for my stick-straight eyelashes. But I’ll make sure to keep you updated on it! The nail polish. It’s a pretty color, a bluish color with a greenish sheen. However, as I stare at my nails a few days after trying it on my nail, it’s chipped pretty bad. I didn’t put any top coat on it, but I normally don’t when I put on nail polish out of laziness or I don’t have any to use (I know, bad me), but even then my nail polishes don’t noticeably chip until after the 3rd day. A few hours after applying it, it was already chipped. I may still use it because of the color, but I’m not sure yet. We’ll see. I think you just need some base coat and top coat so I'll have to experiment it a little! I didn't even bother using the stencils. I show them and talk about them in my full review of the palette, and although there are a couple of them that I like, they are not something that I would use for myself. I feel like they are a little childish for me, but I think that they are perfect for 1D's younger fans! Overall, I enjoy the quality of the collection. The lipstick, eye pencil, mascara, and a couple of the eyeshadow colors are definitely going to be the most used products in the collection. However, like the evolution of the band's albums, I feel like the "Up All Night" collection is the best suited for younger fans, but if you like experimenting with color, then I think that it is perfect for you! If you are an older 1D fan like I am, the makeup is a subtle way to support and sport the group's merchandise without obviously showing off your love for the boys. If I had to choose, I would love the "Midnight Memories" collection for myself, simply because the colors are more timeless. Regardless, I say that this is worth getting and that if you are a fan of 1D or enjoy makeup like I do, you will love the collection and it will be worth the purchase! The makeup will be launching in the US first beginning August 11th in Macy's, but don't worry, world, they will be coming to you soon as well! Any college-aged or older fans out there? What was your favorite product? Which Makeup by 1D collection do you want to try out? Disclosure: This post is sponsored by Brandbacker and Markwins. All opinions are my own. 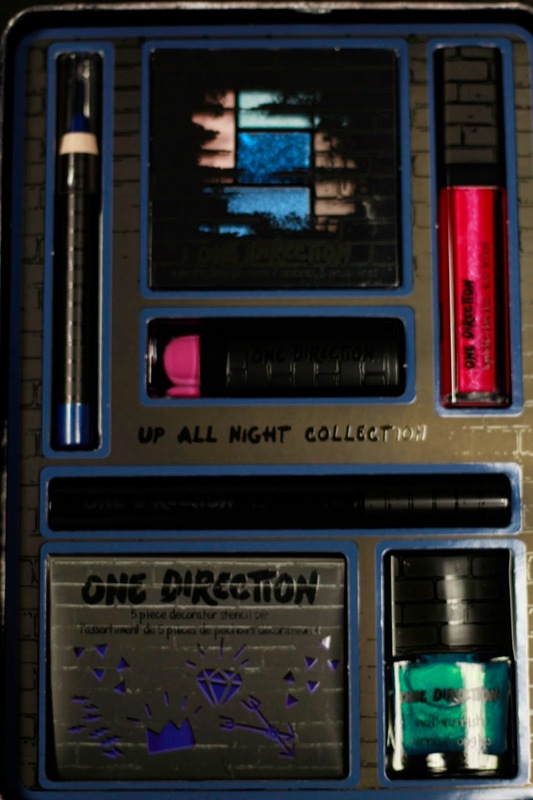 I personally think its a little weird that a boy band has a makeup line. But not going to lie the packaging is really great and I am sure all their young fans go crazy over it. Plus the colors are not half bad like you said. I totally agree with you! I think it's weird too but I think it also really shows the influence they have over younger girls. Good or bad thing, I don't know. And although I like the colors in this collection I'd probably prefer them from their other collections! "there's a lot of glitter...like a lot" ~quote of the day brought to you by Kriselle~ hahahaha. You know I'm with ya in the "older fans" category! Maybe we can have a jam sesh/dance party when you hit up my coast :D I got his same tin (and also wished I'd gotten the Midnight Memories version. Is it just me or did they only send out Up All Night?) I was one of the winners in the makeup giveaway though, so fingers crossed I'll get one? I'm not a big 1D fan but that blue swatch looks amazzzzzzzzzing! My 16 year old is a big 1D fan and she even finds it weird that they have a make up line (she's also not a fan of their perfume either). It kind of reminds me of the "collections" E.L.F. makeup has. I hear they now have collections representing Disney characters so I guess 1D having them really isn't *too* weird. Wow! They really have a makeup kit. That's so crazy! These celebs will slap their name on something in a second! I know all the little girls are going to purchase this.